While the Los Angeles Kings continue to figure out their scoring situation, finding a way to play Jonathan Bernier yet in net, may be even more vital to their success. Yes Jonathan Quick and the Kings’ defense has been the backbone of the team this season, but recent history suggests a more equitable distribution of duties between the pipes, goes a long way toward making a deep run to the Stanley Cup. Let me lay this out before I go any further. No one is arguing Quick isn’t a number one goaltender. One may even make the leap and suggest Quick and Steven Stamkos are inverse Hart Trophy candidates, willing their respective squads to a shot at the post-season. Having said all of that, many would suggest that Bernier is a “1A” backstop and could start on more than half the teams in the NHL. 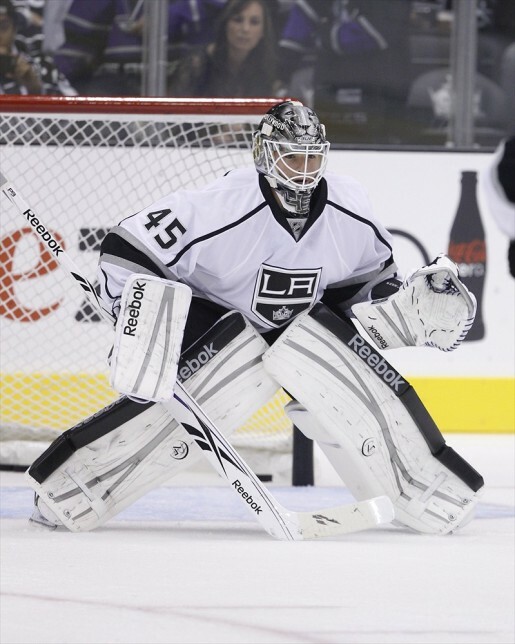 So if the Kings want to avoid burnout and undue pressure to Quick, they must make more of an effort to play Bernier. As of this writing, Quick has started in and appeared in 55 games, or good enough for sixth most in the NHL on the campaign. Meanwhile, Bernier has started ten contests and appeared in 13 games overall. At this point, with the Kings battling for the Pacific Division and the final playoff spot, I can’t see how Quick isn’t going to cross the 60 plus games played threshold. Yet as I’ll show, as with writing, with goaltending in the playoffs, sometimes more is less. Right now eleven goalies have appeared in 50 or more games. Of those eleven teams, six (with Winnipeg just barely) would be in the playoffs if they started today. In the next quadrant of goalies whom have played between 40 and 50 games this year, there are 12. Eight of those 12 clubs (with Dallas just sneaking in) would qualify as of right now. In both of those respective groupings, Quick and Ryan Miller are knocking on the door. Then to round it out, you have two teams with goalies making less than 40 appearances, who would make it in today, Florida and St. Louis. During the regular season last year, Tim Thomas played 57 games in the regular season for the Boston Bruins. Conversely, Roberto Luongo of the Vancouver Canucks played 60. Sure three games is splitting hairs, but Thomas played in and finished all of his teams games in the post-season and captured the Conn Smythe Trophy. In 2010, Antti Niemi didn’t even lead the Chicago Blackhawks in games played by their goaltenders. Niemi only started less than half of his teams games (39) but helped guide Chicago to the Cup. Looking at the runner-up Philadelphia Flyers that season, Michael Leighton (27), Brian Boucher (33) and Ray Emery (29) divvied up the share of the Flyers goaltending duties for that year. Sure all of those goalies played more than Niemi, but Philadelphia while playing the role of outlier, seems to epitomize this list as well. Speaking of an outlier, Marc-Andre Fleury played 62 games for the 2009 Stanley Cup Champion Pittsburgh Penguins. That same season, Chris Osgood of the Detroit Red Wings, played just more than half of his teams games, with 46. That season Fleury was 24 and Osgood 36. The season prior, Osgood again led his Red Wings with 43 games played. Dominik Hasek played 41 and Jimmy Howard four. Osgood took over for Hasek in the playoffs and Detroit rode him to a Cup. Fleury with Pittsburgh that season, played 35 games, leading the team but hardly over-worked. During the 2007 season, J.S. Giguere played 56 games for the Anaheim Ducks and Ilya Bryzgalov posted 27. On the flip side, Emery played 58 games and Martin Gerber 29, for the Ottawa Senators. Hence, in this particular case, the goalie with less games played took home the Cup. Finally, we have the case of the Carolina Hurricanes and Edmonton Oilers. For Carolina, Gerber played the majority of the games with 60, while Cam Ward played 28. Over the course of the regular season for Edmonton, four guys played 18 games or more for the Oilers. Jussi Markkanen (37), Mike Morrison (21), Dwayne Roloson (19) and Ty Conklin (18). Roloson made the bulk of appearances in the playoffs for the Oilers with 18, or one less than his regular season total. Likewise, Ward played in 23 post-season contests and wound up winning the Conn Smythe Trophy. In summary, since the lockout, we’ve had only one goalie (Fleury) to play 60 games or more in the regular season and win the Stanley Cup. There was a split of winning goaltenders, who played over or under 50 regular season games, to win the Cup. This may be more of a reflection of the winning team having a more solidified goaltending situation, but only one of those team’s (Vancouver) had a goalie play 60 games. Also, on that list of goalies who played at least a game in the playoffs, nine played less than 40 regular season games. I do realize that there are multiple factors beyond a specific goalie and that there is something to be said for riding the hot hand. Yet if post-lockout past is prologue, one would certainly think it best to have a fresh netminder come the playoffs.